How long have you been creating things and what inspired you to begin creating things? 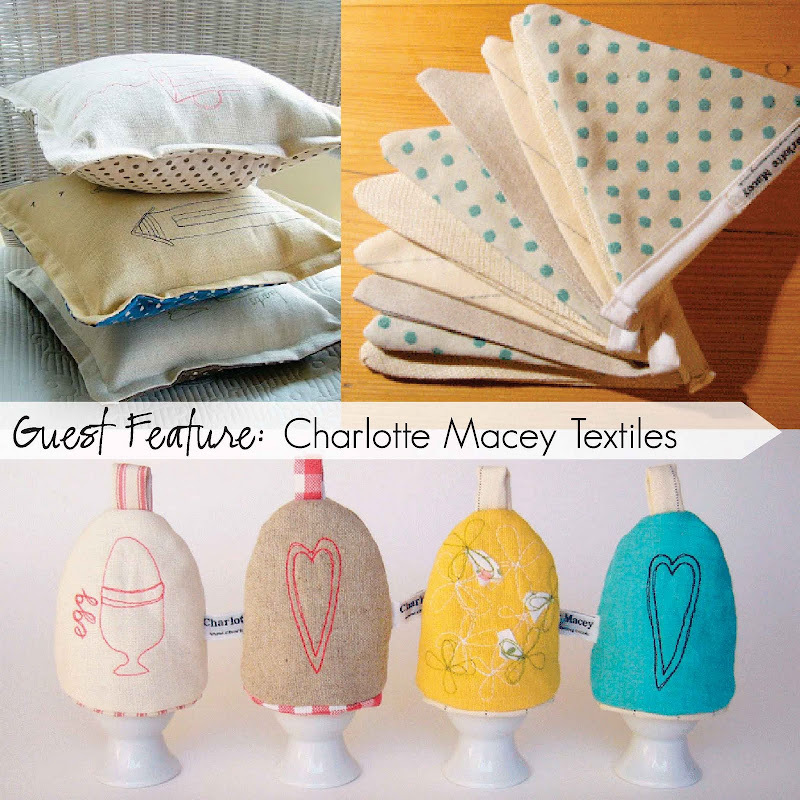 Charlotte Macey Textiles officially began in 2009 after graduating in textile design a few years before that. Life took me on a round about route to realising I wanted to pursue the design and creation of my own range of homewares. I started out stitching tea towels, and from these humble beginnings my range has grown significantly. I pour love and care into each item I make, finishing each to the highest standard. My fabrics are sourced locally in the Cotswolds, and I hand make each item individually, so no two of my products will be exactly the same! What is your shop name and what do you sell? My shop is called Charlotte Macey Textiles, simple and to the point! My shop is currently selling my range of textile home and kitchenwares, as well as a spot of illustration! How long have you been selling online? I began selling online in Summer 2009, firstly on sites such as Misi and Folksy, and then setting up my own website too. Describe your creative process: How, when, materials, etc. I source all my fabrics locally to support local businesses; I use high quality materials, and set to work with my sewing machine. I overlook a beautiful valley from my little countryside studio, and this is where I design and work. At the moment I am working a lot, I am enjoying every moment of it, but need to be reminded to take breaks! Do you promote your shop? If so, how? The main promotion I have been doing for Charlotte Macey Textiles has been online, on sites such as twitter and facebook, and promoting my blog and shop actively online. I’ve recently got into twitter and tweeting, and find it is lovely to hear about what everyone is up to, especially when I am up to my neck in tea towels! Do you sell your items anywhere else (such as boutiques, craft fairs, etc)? Where? I did a few craft fairs leading up to Christmas, and since then have been focusing on increasing my number of stockists. I’m so happy to say that my products are now stocked in some lovely shops around the UK. I wanted to fry some bigger fish on the craft fair front, so have chosen to do Craft & Gift 2010 in Harrogate, 18th - 21st July. It will be my first ‘trade’ fair, so I’m feeling a little daunted at the prospect at the moment! What keeps your creative juices flowing? How or what are you inspired by? I find inspirations in the ‘everyday’ and the things around me, from trips to the seaside, to the countryside where I live. I love to stitch the things I see, and have designed and developed my range in my studio, with the help of lots of tea and biscuits! How do you keep track of things that inspire you or ideas you have? I use a lot of notebooks, and scraps of paper if inspiration strikes when I’m away from a notebook. Ideas often appear at inopportune times, so I have even used napkins in emergencies! When you hit a creative wall (not feeling like creating, or what to create, etc) how do you get your creative juices flowing again? Usually taking a break with a good cup of tea, and generally just getting away from my desk and my sewing machine for a moment always helps, a change of scenery is always good. What challenges do you sometimes face when creating? Each day poses new challenges, when I am creating and also on the business side of things. I am constantly learning, and I find this really exciting. What goals do you have for your shop? At the moment I am gradually increasing my stockists, and finding new locations for people to see my work. One day I would love to have a pretty Charlotte Macey Textiles shop, so watch this space, maybe one day! What advice would you give to someone who is new to selling online? Mainly I try to keep my photos clean and fresh, with a plain background. I sometimes don’t follow this rule, but I do try to set a scene in-keeping with my general shop style, which I think is important for any brand. wow, this egg coseys are so CUUUUUTEE!! What a lovely feature. I've admired Charlotte's work on folksy for a while and even featured her cosies in a Folksy Friday post before but hadn't come accross her blog before now. Lovely giveaway - count me in! Have just become a follower. I think Charlottes work is lovely. Would love the chance to win one of her egg cosies. Those egg cosies would defiantly entice me to eat eggs! cute egg coseys. just stopping by to say thank you for your sweet comment. i really appreciate that. btw...love all the creativity on here. Darling! Would love to win :) I'm a new follower of Charlottes - thanks for the contest!